Come & hear the stories of amazing thinkers and doers on the theme of "Changing The Way We Eat": TEDxManhattan Viewing Party at Jimmy’s No. 43. Location: Jimmy's No. 43 -- 43 E 7th Street, Manhattan, NY 10003. Date & time: Saturday, March 1, 2014 from 10:00 AM to 6:00 PM (EST). This event is free but spots are limited and RSVP needed due to limited space. Please click here for your ticket and place to reserve your spot on the door list. 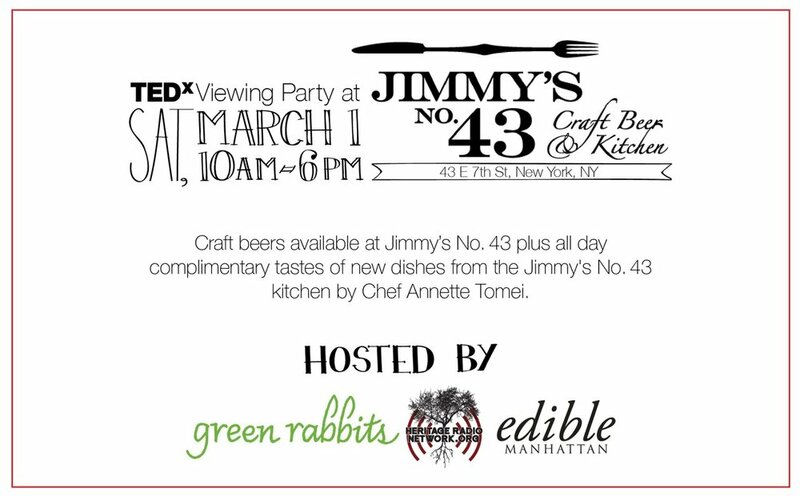 There will be complimentary “food party” snacks by amazing guest chef Annette Tomei: culinary muse at Jimmy’s No. 43 and former instructor at the International Culinary Center and Institute of Culinary Education. Co-hosted by Jimmy's No. 43, Heritage Radio Network, Edible Schoolyard NYC and Green Rabbits. Do We Want Organic Agriculture, or Just Organic Food? Nov 7 Elections Are Over, Now Back to Dealing With Sandy: Go Out and Eat!